What Temperature Should I Cook Chicken Breasts? If you want to cook chicken breasts, but you're intimidated because you aren't sure what temperature to cook them, or how to tell when they're done, it will be reassuring to learn that it's no big mystery. Obviously, you don't want to serve undercooked chicken. But overcooked chicken is a far more common plight. It's particularly the case with chicken breasts, which are lean to start with, and tend to dry out and turn stringy if they're cooked for too long. 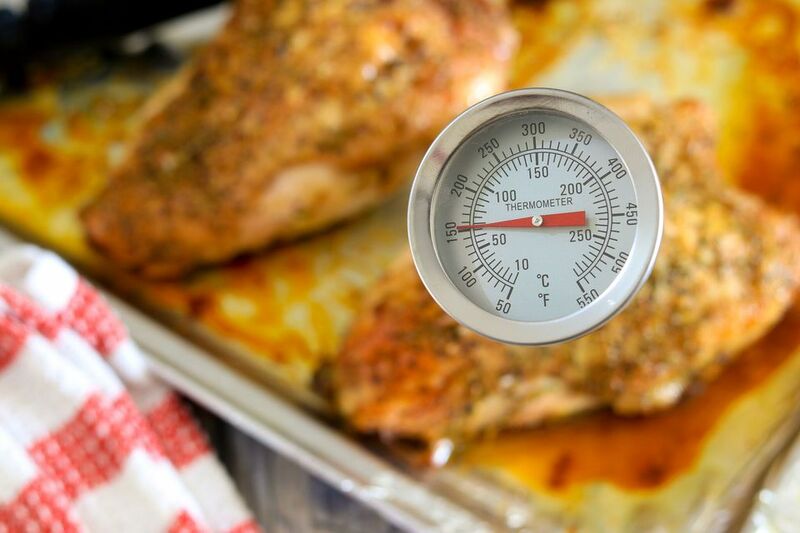 Cutting into the breast to check whether it's cooked all the way through will help make sure you serve it at the right temperature, but you'll lose flavor by doing so. The more holes you poke in it, the more of its juices are going to leak out. That goes for holes poked with an instant-read thermometer, too. That goes for roasted chicken, baked chicken, whole chickens, chicken pieces, whatever. This is not to say that various recipes won't suggest cooking at different temperatures. But if you're only going to remember one number, 375 F might as well be it. By the way, oven thermostats can go out of calibration, which means that they display a temperature other than the correct one. To make sure your oven temperature is always the you want it to be, measure it using one of these oven thermometers. If your oven is off 10 or 15 degrees (which is not unheard of), you'll be able to adjust. All chicken breasts aren't the same. Some are bigger than others, and bone-in chicken breasts take longer to cook than boneless ones. In general, though, an eight-ounce boneless chicken breast will be done in 30 minutes in a 375-degree oven. For a bone-in chicken breast, you'll want to add about 10 minutes of cooking time, but otherwise, the process is the same. It is possible for your chicken to cook faster, especially if it's a thinner breast or if it was pounded before baking. Chicken breasts will basically tell you when they're done—all you have to do is look for the juices. When a chicken breast is cooked through, you'll see clear juices start to seep out of it. Clear, meaning the juices won't have any dark bits suspended in them. Start peeking into the oven at around the 20-minute mark (preferably without opening the oven), and check for a little pool of clear chicken juice in the baking pan. That pool will get bigger and bigger as the juices flow out of it, and then it will start to sizzle. Once you see that, take the chicken out, cover it with foil and let it rest for about 5 minutes before serving. If you forget and cook it too far, that little pool of juices will simply boil away, and maybe turn into a brown crust at the bottom of the pan. If you see that, take the chicken out. TIP: Brown your chicken breasts in a hot pan for 3 or 4 minutes per side, and then finish cooking them in the oven. If you cook them this way, they might only need 15 to 20 minutes in the oven. But again, watch for those clear juices, and you won't go wrong. Should You Boil Spareribs Before Baking or Grilling? What is Connective Tissue, and Why Does it Make Meat So Chewy?